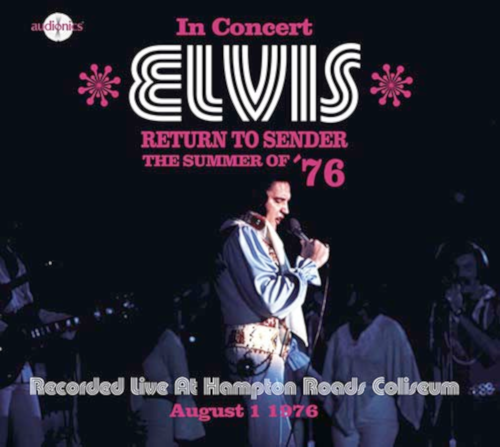 Audionics just released the August 1, 1976 Hampton Roads show, not a new one, since it the 3rd release on a well known label. The 'design' is very poor. The front is still a matter of taste, it happens I don't like the font and snowlakes in August aren't my thing either. The inside and back are a mess. The linernotes and tracklisting are hardly readable. A pink font does not work on a full colour picture (don't think any colour does, but pink certainly not). When the original Fort Baxter came out I skipped it after listening to it at a friend's place, with two little kids I could use my money better than on a poor show. I got the attempt by Gravel Road Music, Star-Sprangled Spectecular Bicentennial ‘76, I must have been drunk or high on the '72 show at the same venue, while reviewing that, since it is about the worst nonsense I ever wrote (and that really means something!). Well, the show pretty much stinks, as the review by Aki Korhonen in our archive says. I was told it is a bit more complete than the Fort Baxter, but can't check that for obvious reasons (not that I really care). I compared a few tracks with the GRM release and I do like the sound of this one better since the 'highs' are not over the top. I don't see the sense of the bonus songs after a complete concert, certainly not when the sound quality between them differs a lot. Still it will be a unique momento in time, me playing this CD. I can promise it will never happen again. Gladly I received a Jerry Lee Lewis LP to clean up my ears today . I liked the photo of the RETURN TO SENDER CD, but in general the art did not leave anything to be desired, it does not compare to previous works. It is difficult to read the text. On the other hand, I liked the sound. Lex is right. The show stinks to say the least. Elvis has something in his system for sure. Bad horse voice also. Well Lex, what a very strange review. „Conclusion: I didn‘t like it.“ Not a single word about the very rare ‚Return to sender‘. Soundboard and a complete show. „The design is very poor.“ It is one of the better ones for sure. And why do you have to clean your ears? Elvis is in a good mood and the sound is also very good. Are you sure that your words belongs to this CD. I have my doubts.